I don’t often like to book tours last minute, but this day tour is the perfect example of me doing what I don’t typically do. Usually, I book my tours several weeks prior to arriving in a country. It is relatively rare that I try to book tours while in the country although it does happen on occasion, especially if I did not prepare or do research on a location adequately (Nicaragua and the Dominican Republic). In the case of Bolivia, since I was not entirely sure whether I would be successful with the visa, I did not want to put down the money for tours in case something happened such as the possibility of being denied a visa. However, I did book one of the two tours that I ended up doing in Bolivia in advance. This particular tour was done as a snap decision. The day tour to Isla del Sol was originally not even on my travel radar. In fact, I had never even heard of the place before. 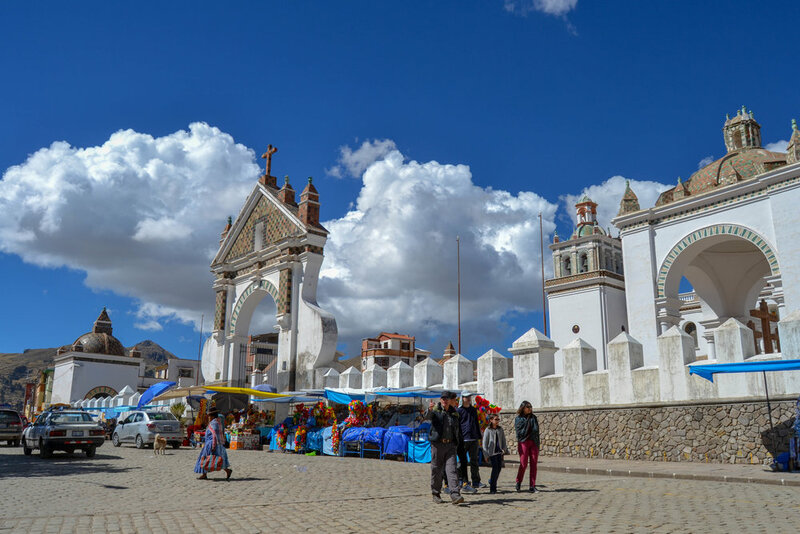 I only become aware of its existence when I stopped into the travel office in the hotel I was staying at and started looking at tours before heading out to explore La Paz on my first day in Bolivia. As I looked at the different tour offerings, the day tour to Isla de la Sol (Island of the Sun) seemed like a perfect activity. It included round trip transportation from/to La Paz via bus with Bolivia Hop, some time to explore the town of Copacabana, which is on the shores of Lake Titicaca, and a self-guided hike on Isla del Sol with a boat scheduled to take you to and from the island on Lake Titicaca. Without much hesitation or thought, I had the girl at the travel desk book it for the very next day. After I spent my first day exploring La Paz, I awoke extra early for a 6:30am hotel pickup with Bolivia Hop, which is a bus company that does a lot cross-country journeys from Bolivia to Peru and vice versa. Much to my surprise, despite being a modern bus, there was no heat on it, so I was admittedly a bit cold for a good portion of the trip. Thankfully, I made sure to wear a long sleeve, two scarves, and a jacket, so it was not too bad. Unlike a lot of other tours that I have been on in the past, this was not necessarily a guided tour. Instead, Bolivia Hop is more of a transportation company. Once everyone was on board, the attendant came through and checked our names, and then he gave some informational sheets about what the day would entail. I have to say, the information that the attendant gave out was very clear and detailed, and it cleared up any questions that I might have had. The informational sheets talked about the trip/hike on Isla del Sol, the bus schedule from La Paz - Copacabana - La Paz, and a very easy-to-read map of the town of Copacabana. In addition, a sheet on how to do the border crossing from Bolivia to Peru was also given since some people on the bus were heading to Peru via bus. The goal was to get to the town of Copacabana by 11:30am. From there, we would take a ship to Isla del Sol. The first couple hours of the trip were uneventful, so I spent most of the time catching some Zs and taking in the Bolivian landscape. At around 9:45am, we arrived at our first major destination; the Strait of Tiquina Ferry Crossing. Since there is no bridge, everyone had to get off the bus for safety reason and get onto a small ferry that would take us to the other side. The Bolivia Hop bus would be ferried across the Strait on a flat barge. Once we were on the other side of the Strait, we were given the chance to use the washroom if needed, and once the bus was unloaded from the barge, we boarded the bus and continued on our way. Shortly before we got to the town of Copacabana, we were treated to a spectacular view of Lake Titicaca and Copacabana from the Mirador Viewpoint (see top image). Once I saw this view, I knew that I had made the right decision in making the snap move to book this tour without thinking. The view was to die for, and it could not have provided better photo opportunities. The view itself was definitely worth it, and the weather could not have been better. There were relatively few clouds in the sky, the sun was shining, and it was not nearly as cold as it was in the morning. After giving us some time for photo ops and taking in the scenery, we got back on the bus and continued onto the town of Copacabana. Once we arrived in Copacabana, some people who were staying in the town gathered their luggage and went off to their hostels. The rest of us were given free reign of our time to do as we wished. We just had to make sure to be at the boat on the shores of Lake Titicaca at 1pm (13:00) for the departure to Isla del Sol, or the boat would leave without us. Since I had an hour to kill, I headed over to the Basilica of Our Lady of Copacabana, which is a colonial church that dates from the 16th century, in order to see the statue of the Virgin of Copacabana. During my research about Bolivia, I had read that this is a famous statue in the country, and I wanted to see it for myself. The church itself is fairly large with a beautiful interior (see photo gallery below), but the small chapel where the famed statue is located was where all the attention was. Like other images of the Virgin Mary that I have seen in Latin America, this one was not particularly different. The statue was ornately decorated and had a bow featuring the colors of Bolivia wrapped across the sideways moon that Mary is standing above. Since Mary is the Patron Saint of Bolivia, he flags of Bolivia and Vatican flank her on both sides. The altar is dedicated with many lilies to symbolize her purity and virginity. In addition to the statue in the chapel, there was also another room that functioned as a museum of sorts that featured statues of Mary and her particular patronages that are common in Central and South American countries. After visiting the Basilica, I still had some time before the boat for Isla del Sol departed, so I stopped into one of the small restaurants for a quick bite to eat, but the service was taking longer than I expected. Because I needed to catch the boat, I had to cancel the order. Much to my surprise, the waiter was not angry and did make me pay for anything since the cook hadn’t even gotten to making the food yet. At the scheduled time, the group met up again, and we got on an hour-long boat ride to Isla del Sol. The guide did not come with us, but we were told prior to arriving in Copacabana that we would have about 1 hour to make a hike from one end of the island to the other where the boat would be waiting. We would also have time to enjoy the various viewpoints that the hike offered, but we could not drag our feet since we were told to take roughly about 40 minutes to complete the hike, or we risked being left behind on the island. Upon arrival at Isla del Sol, I got ahead of the group to get some great shots of Lake Titicaca. I was absolutely amazed at how still and blue the water was. It was literally like a mirror. There were many beautiful photo ops present on the island. In a way, it is almost a type of island paradise. Of course, since people do actually live on the island, there were some farm animals like donkeys and llamas walking around and grazing near the edges of the island. Because there was a time limit, there was not a lot of time to go at a leisurely pace, so I admittedly hurried a bit to get to the other side where the boat would be waiting at the Yumani Port. Once I reached the other side of Isla del Sol, I boarded the boat and decided to sit up top this time since I had sat inside on the way there. By this time, the weather had warmed up considerably from the morning, so it was quite pleasant, but I was concerned about sunburn since there were no clouds in they sky, and I was on an open boat with no canopy. The ride itself was very pleasant and relaxing. Most of the trip was spent taking in the scenery and chatting with some of the other members of the group. After the hour-long boat ride back to Copacabana, we had another hour to spend before the Bolivia Hop bus would arrive to take us back to La Paz. Since I had time, I decided to stop in a different restaurant and had a dinner of tacos at one of the many places lining the main street. After dinner, I spent some more time walking around and then waited for the bus with the other passengers. The bus arrived a little bit late at the appointed spot, but soon we were on our way back to La Paz. By this time, the temperature was dropping, and it was starting to get quite cold. By the time we had reached the Strait of Tiquina Ferry Crossing, I was absolutely freezing and could not wait to get back on the bus since we all had to leave the bus again to be ferried on a boat while the bus was ferried across the Strait by a barge. By the time we reached La Paz, it was 11:30pm. This day tour to Isla del Sol had been a true daylong tour, and while it was tiring, it was absolutely worth it. The views of Lake Titicaca were stunning, and it was definitely a high point during my trip to Bolivia. I’m incredibly grateful that I happened to visit the tour office in the Qantu Hotel. If I hadn’t, I would have never had the opportunity to see what I had seen on this tour. Have you been to Copacabana and Isla del Sol? What did you think of it?